MOSCOW (Sputnik) - The prediction by European Commission President Jean-Claude Juncker that the European states will be superseded from the G7 group by larger nations by 2050 is warranted albeit shocking, experts and politicians told Sputnik. On Thursday, Juncker said after a meeting with Finnish Prime Minister Juha Sipila that India and China were outperforming EU states and would soon be part of the elite G7 club while European states would not. Juncker noted that the EU "is losing weight from a demographic point of view," with EU population projected to constitute only 4 percent of the world population at the end of the century. Also, Europe's share in the global GDP is expected to drop from today's 22-23 percent to some 15-17 percent in 20 years, the president said. 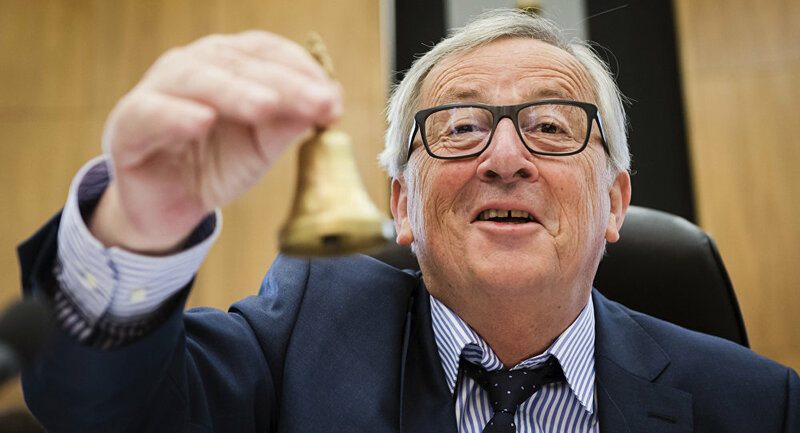 "Juncker likes to shock, to be provocative," Mischael Modrikamen, the director of The Movement nonprofit organization to promote economic nationalism in Europe, told Sputnik. Recalling Juncker's statement in 2015 right at the height of the migration crisis that "the migrants were a great chance for Europe," the expert said that this was a lie to reassure Europeans scared of unemployed young Muslim men who were likely to become a burden for the EU social security even before they brought their families. "This time, unfortunately, Juncker is right in his provocative prediction. The G7 cannot ignore that China and India are already economic powerhouses. Their combined population is reaching 2.9 billion people, with a large proportion of very qualified people and a technosphere that has nothing to envy to the European one … It is written in the stars that they must join the club, that Russia should be re-integrated and that this G10 will be the economic force driving the world 20 years from now," the expert said. Modrikamen expressed doubts that France and Italy would be able to secure their spots on the G7 in the future. "The United Kingdom will have regained its independence and will probably still be an important economic power in two decades. As for the rest of Europe, they can present themselves as an economic center, even if – as we hope – the present political structure of Europe is dismantled, and sovereign states re-established," the expert said. Steven Woolfe, a member of the European Parliament for the North West England region, linked the issue back to Brexit. "Juncker is admitting that in years to come, the European Union will not be competitive enough or productive enough to remain in the G7… The economically and demographically vanishing European Union is disappearing in global importance. Meanwhile the United Kingdom is the world's fifth largest economy, has a growing population, and intends to be in the G7 in 30 years time — which is why Britain wants to break with the shrinking European Union," Woolfe said. "The president of the commission is right to mention demographics as a major issue for the survival of the European economic strength. We need to entice young European couples to have children," Filip Dewinter, a member of the Belgian federal parliament, said when commenting on Juncker’s speech to Sputnik. However, the taxes in Europe are very high, especially for working people, Dewinter said. "So you have young couples both working hard to pay for the apartment and pay their taxes, while migrant families are ‘reunited’ and have children at the expense of our social security systems while their level of education is very low and they can’t participate to the creation of wealth," the politician said. Italy, having the second highest population of elderly people and one of the lowest birth rates in the world, is starting to develop a natalist policy for young Italian couples as a response. The measures envision granting farming lands to young married couples with three children. The offer is limited to married Italian couples, but foreign couples who have lived in Italy for at least 10 years are also eligible. "[The initiative] is attacked by the left parties and the EU that prefer, I suppose, to bring in replacement populations from Africa and the Middle East," Dewinter said. G7 currently consists of the United Kingdom, Germany, Italy, France, Canada, the United States and Japan. Russia was temporarily suspended from the group in 2014, known as G8 back then, following Crimea's reunification with the country. In 2017, Moscow said that it was not considering in any way its return to the group.